Here is another recipe from my Aunt Dot's wonderful new cookbook All the Foods We've Loved Before. The recipe is a classic recipe from my grandmother Lela, also a great cook. Moisten yeast in 1/4 cup warm water. Add 1/2 teaspoon sugar. Let stand. Add shortening, rest of sugar and salt to hot milk. Stir until sugar is dissolved. Cook, then add egg. Stir in softened yeast. Next add flour into liquid until will mixed. Turn dough onto lightly floured board; knead quickly until smooth and elastic. Form into a smooth ball. Place ball in a well greased bowl and turn over once or twice to grease entire surface. Cover and let rise in warm place until double in bulk. Knead well again and shape as desired. Place in greased pan, cover and let rise for one hour more. Bake at 400 degrees for fifteen to twenty minutes. My Aunt Dot Pourteau recently published her second cookbook titled All the Foods We’ve Loved Before and I was happy to see recipes from my uncles, aunts, cousins, grandmother, and yes, even my own mother. Dot is a wonderful person as well as a wonderful cook. She was married to my Uncle Bertrand for many years before his untimely passing. 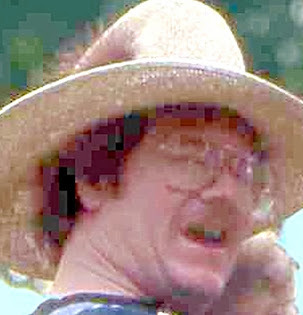 Bertrand grew up in Oil City, Louisiana. He was of French extraction and his parents owned a cafe in the fabled oil town of Oil City. To say that the Pourteau’s could cook is like saying the sky is blue. Here is a recipe from Aunt Dot’s wonderful cookbook. This is a very rare recipe that I don’t believe you will find anywhere else. It was perfected by a family of French descent that catered to the ravenous appetites of the oil patch. Try it if you get a chance and I’ll give you my Oklahoma guaranty that you won’t be disappointed. Clean chicken and remove skin. I use a Dutch oven to cook this dish in, spray bottom of pan with Pam to avoid sticking, put in the chicken skin and cook the fat out until skin is crisp. (This fat that is rendered out of the skin helps give it a little bit mor chicken flavor). Besides, Penny, our son Steven’s dog that is making a home with us at the time, loves chicken cracklings. Salt and pepper chicken pieces. Fry chicken pieces until they are light brown. Take out the chicken and set aside. Add onion, celery, bell pepper and garlic. Add olive oil, if needed, to saute vegetables until they are limp. Sprinkle vegetables with a small amount of salt and pepper. They will smell soooo good. Add 1/32 cup flour and make a roux. Do not let the flour get very brown, just a light tan color. Add approximately 2 1/2 quarts boiling water slowly to roux and four cubes of chicken bouillion. Taste broth, as it may need to be reseasoned at this time. Return browned chicken to broth, cook on low heat until tender (DO NOT OVERCOOK CHICKEN!). Remove chicken from broth. When ready to serve thicken the broth with about 3 tablespoons cornstarch in about 1/3 cup cold water. Slowly stir the slurry of cornstarch into broth. Let broth come back to a slight boil, then you can tell if the broth is as thick as you wish, if so return chicken to liquid and cook, very slowly to avoid scorching, about ten minutes. TO SERVE: Put steamed rice in individual serving bowl and sprinkle with file, as desired. DO NOT put file in gumbo while cooking. Put chicken pieces over rice and ladle gumbo over all. May serve with a side order of salad. Lettuce, tomatoes, celery, carrots, and anything else you like. Garlic bread is also good with this meal. 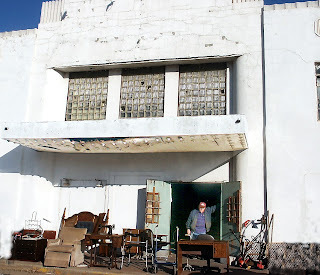 Here are a couple of pics of the Penn Theatre located in a strip center near 12th and Pennsylvania in Oklahoma City, Oklahoma. 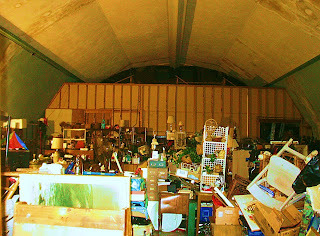 Today, the theatre houses a junk store. Check out the story at http://www.ericwilder.com/ .